Test-Guide.com's sample PTCB questions are an excellent way to study for your upcoming Pharmacy Technician exams. Our sample tests require no registration (or payment!). The questions are categorized based on the PTCB test outline and are immediately scored at the end of the quiz. Once you are finished with the quiz, you will be presented with a score report which includes a complete rationale (explanation) for every question you got wrong. We will be adding more sample test questions in the near future, so please come back often. If you like these Pharm Tech practice questions, please make sure to like us on facebook! Understanding the Test Format - Every standardized test has its own unique format. 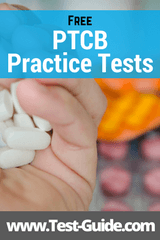 As you take practice Pharm Tech tests you will become comfortable with the format of the actual PTCB test. Once the test day arrives you will have no surprises! Know the Tricks - All standardized tests have certain "tricks" that they use to get you to select the wrong answer. By taking practice tests, you will learn to spot these trick questions...and choose the right answer. Passing the PTCB exam allows pharmacy techs to use the CPhT (Certified Pharmacy Technician) designation. In order to continue using the CPhT designation, however, pharmacy tech's must successfully complete 20 hours of continuing education every two years. The PTCB exam is a multiple choice exam that has 80 scored questions and 10 unscored questions. The exam is taken on a computer and administered by Pearson Vue. Candidates are given 1 hour and 50 minutes to answer the exam questions. Pearson VUE is responsible for administering the Pharmacy Technician exam. To schedule and exam appointment, candidates can go to www.pearsonvue.com/ptcb or call 1-866-902-0593. Pearson VUE operates over 250 test centers nationwide. Additionally, Pearson VUE allows military personnel and qualifying dependents to take the exam at approved military sites. The current fee for the PTCB exam is $129. Candidates may change their exam appointment up to one business day before their appointment. Exam fees will be forfeited if a candidate does not show up for their exam appointment. Valid High School Diploma (or high school equivalent certificate such as GED, HiSET or TASC). Full compliance with all appropriate PTCB certification policies. Complete disclosure of: State Board of Pharmacy registration/licensure actions and any criminal convictions. Successful completion (passing) of the PTCE exam. Violation of any PTCB certification policy such as the code of conduct. A candidate's participation in any criminal activity. Any State Board of Pharmacy licensure or registration action involving the candidate. The PTCB exam uses scaled scores to help keep the scoring similar from year to year. A candidate's raw score (the number of questions a candidate answered correctly) is transformed to a scaled score. Scaled scores on the PTCB exam range from 1,000 to 1,600. A passing score for the exam is 1,400. This passing score was determined by a panel of subject-matter experts who evaluate each test question and estimate the percentage of qualified pharmacy technicians who would answer the question correctly. Offical score reports will be available online approximately one to three weeks after the exam date. Candidates are also given the option of having their score reports emailed to them. Candidates who pass the exam will receive a certificate and wallet card approximately four to six weeks after the exam. Candidates who fail the exam are allowed to retake the exam after 60 days (for second and third attempts). If a candidate fails the exam three times, they must wait six months to take their fourth attempt. After four failed attempts, candidates must provide evidence of completing acceptable preparation activities in order to be allowed to take the exam again. Nursing - Most Nursing programs will require you to take admissions exams. You can prepare with either HESI A2 practice tests or ATI TEAS 6 practice tests. CNA - To study for your CNA examination, try our CNA practice tests. EMT - To see if your capable of becoming an EMT or Paramedic, you should take our EMT practice tests. Medical Assistant - Medical assistants are certified by multiple agencies. Our CMA practice tests, RMA practice tests, and NCCT practice tests cover the most popular certification exams.